On Monday 24th October, French authorities initiated the process of demolishing the Calais camp. On Monday morning residents of the Jungle queued from the early hours to board buses to accommodation centres around France. Little information was known by those directing the eviction, and the press and charity organisations on the ground were often the only source of information for those in the camp. Help Refugees on Monday showed that 49 unaccompanied children had to remain in the Calais camp all 13 years old or under. All eligible under the Dubs amendment for resettlement in the UK. Up to 1,000 unaccompanied minors were made to stay in shipping containers on the understanding that they would be housed there until they were properly processed. Children were asked to go to the warehouse for registration to queue up only to be sent back to the containers. Others were told registration had stopped for the day. This chaotic set up has been extremely distressing and confusing for the lone minors, the youngest of which is 8 years old. The younger children are struggling to understand where they are supposed to go, and how they are supposed to get there. By the end of day 1, 1900 people left on buses to accommodation centres, way down on the 3000 planned. 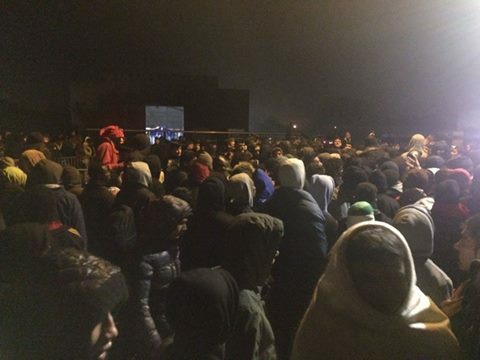 On Tuesday, residents of the Calais Jungle queued from the very early hours. Authorities started dismantling the camp whilst volunteers salvaged useful structures and materials to transfer to refugee camps in Greece. More adults were registered and transported on coaches to Accommodation Centres around France. Later in the afternoon, no queues remained for adult registration. Registration for children was stopped during the afternoon, with minors not yet registered told to return tomorrow. Entry to the queue for children’s registration was allowed on the basis of a two-second visual age check by French authorities. The main concern after Tuesday was the large number of unaccompanied minors who had to spend another night in the Jungle, risking violence, fires and other dangers. 20 children who couldn’t register were sleeping in some of the community mosques as large fires broke out around the camp. 8 young people with nowhere else to go slept under a blanket just outside the perimeter. After several hours, police escorted 16 unregistered children to the containers to sleep in safety. French fire services were initially slow to arrive but eventually responded to the fires well – only one person was injured. Most shops and restaurants have burned down. 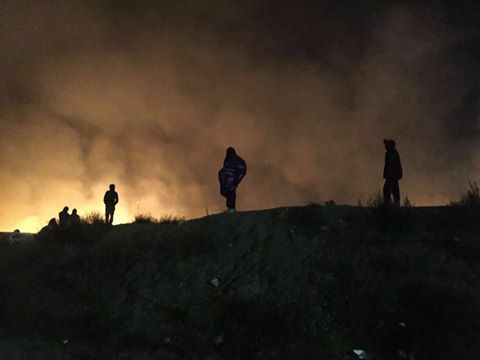 People gathered from 2am with their belongings on the road between the Jungle and the registration warehouse, wanting to escape fires and be first in line for the buses this morning. Large fires continued throughout day three of the evacuation. 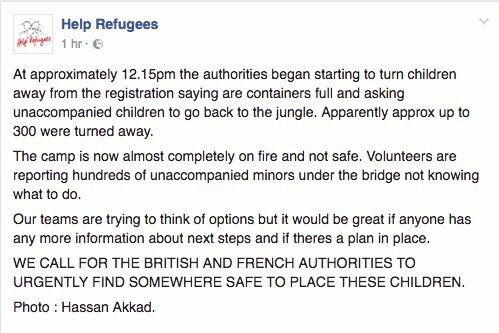 Despite fires the registration queue for minors CLOSED around midday and children were sent back to the Jungle, where large fires continue. Not a safe place for anyone, let alone children. Police cordoned off the Jungle and evacuated people from the camp into the ‘no-man’s land’ area. Fire crews worked in camp to control fires. The container camp where children were being temporarily housed became full, and registration stopped. Charities called for urgent action from the authorities to safeguard minors not yet registered. BBC is reporting that the camp has been cleared, but we want to make clear that this is definitely not the case. While most people have been evacuated, some residents remain inside. People are also trying to re-enter. Authorities said there will be no more buses to accommodation centres tomorrow, and that the last buses leave by around 8pm. If true, this is concerning, as many people remain in camp. On the morning of the 27th October around 300 people turned up at the registration warehouse to take buses to accommodation centres around France, but were met with closed doors. Police told them to return to the Jungle. What happened to the authorities’ promise that all willing camp residents would be taken to accommodation centres? We also don’t know yet what will happen to the ~100 unregistered minors. Last night, thanks to volunteers, a number were given shelter in the registration warehouse and Chemin des Dunes school. However, around 20 children slept outside, in near-freezing temperatures. Videos started to be released by NGO’s of French authorities arresting minors for apparently no reason around 11am French time. At midday information was given that any people (whether minors or adults) faced arrest if they didn’t have a registration wristband after 2pm. Refugee Youth Service gave an update on the arrested individuals saying they are in communication with the Legal Shelter in the Jungle to try to provide legal aid. It appears (around 5pm French time) that the main, unofficial part of the Jungle is now almost completely empty of residents. NGO’s understanding is that 1500 children are now being housed in the container camp; and charities are trying to ascertain what is happening around the perimeters of the Jungle where some residents appear to be still waiting.